Rocket Embroidery supplies workwear for businesses across Merseyside and the rest of the UK. We Supply customised NHS Uniforms, which are garments that are embroidered with the NHS logo, your name and your department. We also do other types of workwear so make sure to visit our workwear section on our website. Rocket Embroidery is based in St Helens, Merseyside and supplies workwear across the UK. 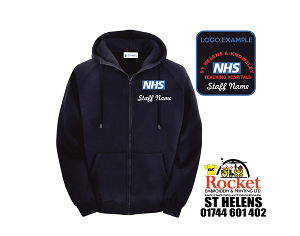 Rocket Embroidery St Helens supply and print uniform for many Professions. We Personalise your NHS Garment with quality Embroidery. Simply email us paul@rocketembroidery.com with your logo requirments – Garment Colour and Size / Hospital Name, Department and Staff Name and we can get your order processed. We set up your embroidery or Print logo and Print or Embroider small or large qualtity clothing orders. We can produce high quality embroidered and printed Hoodies, Poloshirts, T-Shirts etc, with a fast turnaround across the UK. We print for NHS Hospitals all over Merseyside, Lancashire, Cheshire and UK.. Call Rocket Embroidery Today ON 01744 601 402 for a FREE quote on HOODIES, T SHIRTS, POLO SHIRTS, SWEATSHIRTS, TUNICS, TABARDS AND MORE..